(Nanowerk News) Natural gas producers want to draw all the methane they can from a well while sequestering as much carbon dioxide as possible, and could use filters that optimize either carbon capture or methane flow. No single filter will do both, but thanks to Rice University scientists, they now know how to fine-tune sorbents for their needs. Subtle adjustments in the manufacture of a polymer-based carbon sorbent make it the best-known material either for capturing the greenhouse gas or balancing carbon capture with methane selectivity, according to Rice chemist Andrew Barron. The specifics are in a paper this month by Barron and Rice research scientist Saunab Ghosh in the Royal Society of Chemistry journal Sustainable Energy and Fuels ("The effect of KOH concentration on chemical activation of porous carbon sorbents for carbon dioxide uptake and carbon dioxide–methane selectivity: the relative formation of micro- (<2 nm) versus meso- (>2 nm) porosity"). "The challenge is to capture as much carbon as possible while allowing methane to flow through at typical wellhead pressures," Barron said. "We've defined the parameters in a map that gives industry the best set of options to date." Previous work by the lab determined that carbon filters maxed out their capture ability with a surface area of 2,800 square meters per gram and a pore volume of 1.35 cubic centimeters per gram. They also discovered the best carbon capture material didn't achieve the best trade-off between carbon and methane selectivity. With the new work, they know how to tune the material for one or the other, Barron said. "The traditional approach has been to make materials with ever-increasing pore volume and relate this to a better adsorbent; however, it appears to be a little more subtle," he said. The lab made its latest filters by heating a polymer precursor and then treating it with a chemical activation reagent of potassium, oxygen and hydrogen, aka KOH. When the polymer is baked with KOH at temperatures over 500 degrees Celsius (932 degrees Fahrenheit), it becomes a highly porous filter, full of nanoscale channels that can trap carbon. Filters made with a 2-to-1 ratio of KOH to polymer had less surface area -- 2,200 square meters per gram -- and a lower pore volume. That resulted in the optimum combination of carbon dioxide uptake and methane selectivity. The size of the pores was critical as well. 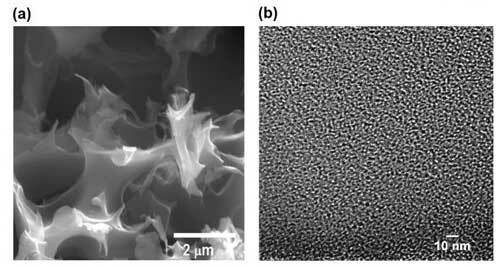 Filters with maximum carbon uptake had the largest fraction of pores smaller than 2 nanometers. Bigger pores were better for methane selectivity. "It appears that total pore volume is less important than the relative quantity of pores at specific sizes," Barron said. "Our goal was to create a guide for researchers and industry to design better materials. "Not only can these materials be used for carbon dioxide separation from natural gas, but they are also models for carbon dioxide sequestration in a natural resource. This is the future direction of our research."